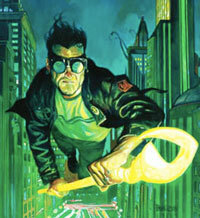 The 1990s DC series Starman is one of comicdom’s most fondly remembered series. Interestingly, says series author James Robinson, it seems to be more popular now than it was when it was actually in production! James joins Tim and Ryan Haupt this week to look back on various aspects of this iconic series, including the theme of “legacy”, a sneaky crossover with another series, a story arc that never happened, the differences in how the Big Two have dealt with their Golden Age characters, and much more. No user commented in " #385 The Legacy of “Starman” "